Brazil´s military police have long equated law enforcement with warfare. But there are signs that the status quo is changing, and worldwide. Brazilian police take over the Chapeu Mangueira favela in Rio. Karen Hoffman/Demotix. All rights reserved.On 14 July last year, military police arrested Amarildo de Souza, an unemployed bricklayer. He was picked-up from the front doorstep of his home in Rocinha, Rio de Janeiro’s sprawling favela, reputedly the largest slum in all of South America. He was taken to the headquarters of the neighborhood´s pacification police unit, deployed there two years earlier. There he was tortured to death by the police and his body was never recovered. The pacification police were originally intended to inject a community-oriented ethos into law enforcement. The idea was radical for a city used to being policed by thugs. The first goal of pacification is to recover slums controlled for decades by drug traffickers, and the second is to then win the hearts and minds of local residents. The tragic case of Amarildo, however, exposes the grave shortcomings of one of the world’s most fascinating police experiments. Brazilians are tragically accustomed to brutality, especially at the hands of their own military police. Between 1985 and 2002 one in every 23 people arrested by Rio de Janeiro´s police force was killed before making it to trial. Compare that to the New York Police Department's (NYPD) record – 1 in 37,000. Rio’s police kill some 80 civilians a month, making them among the most violent anywhere. The pacification police were supposed to change all this. Until recently, the torture and killing of a dirt-poor Carioca at the hands of the police may well have gone unnoticed by everyone but his killers and the victim’s family. After all, 35,000 Brazilians have disappeared without a trace since 2007. But the case of Amarildo shows how the public mood is changing in Rio, and across the country. And technology is playing a part in amplifying local grievances. The suspicious circumstances surrounding Amarildo’s death – he was spotted by a CCTV camera – sparked massive demonstrations online and off. Grainy footage of Amarildo being escorted into the police station went viral and was viewed by millions. Curiously, the same camera that caught Amarildo entering the station failed to record him leaving. Everyone started asking “quem matou Amarildo”, or who killed Amarildo? Within two months, 10 police officers were detained on charges of torture and concealing a corpse. Local newspapers reported that corrupt pacification police officers killed Amarildo, an epileptic, during interrogations that featured electric shocks from a Taser and the wrapping of a plastic bag around his head. Another 22 residents from Rocinha have since reported being tortured by the police. The case is continuing today. In a series of remarkable pilots from New York to Kingston and Cape Town to Nairobi, police are starting to come under intensive scrutiny. Specially developed technologies are being deployed to protect ordinary people from arbitrary arrest and extra-judicial violence. These are already showing results. But perhaps the most interesting one of all is that these tools are not only welcomed by citizens: police officers themselves are equally enthusiastic about the idea. The case of Amarildo triggered a round of soul searching across Brazil about the direction of public security in the Cidade Maravilhosa, or the Marvelous City as Rio is sometimes known. Social media campaigns denouncing the military police and calling for wholesale reform raged throughout 2013 and 2014. Brazil´s Minister for human rights, Maria del Rosario, weighed in, declaring that the “investigation [of Amarildo] reveals the necessity of changes so that the police are more focused, more accountable to citizens and not oriented towards criminal disregard for human rights”. Notwithstanding public hand wringing, incidents such as those occurring in Rocinha are distressingly routine. Part of the problem is that Brazil is an extremely violent place: about 56,000 people were murdered in 2012 alone, many of them residents of favelas of mega cities like Rio de Janeiro and Sao Paulo. To put this grisly toll in perspective, more people are massacred in Brazil each year than in every war zone combined. The country´s military police have long equated law enforcement with warfare. But there are signs that the status quo is changing. 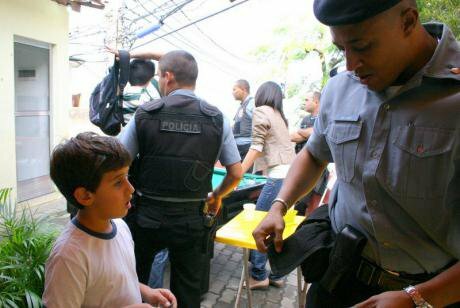 Thanks to the technology revolution, policing in Brazil and around the world is changing. Law enforcement agencies are starting to harness big data detection systems to crowd-sourcing and mobile scanners to improve their ability to anticipate, track and prevent crime. Some police forces have started deploying body-worn cameras. Of course technology alone cannot keep crime at bay. But this is not stopping governments from doubling down on digital solutions. Earlier this year the Sao Paulo government announced an investment of $4.3 million in the Detecta system which will arm 100,000 officers with tablets, laptops and smart phones to a live network of smart cameras. In the United States, these systems are now commonplace. Many of them draw inspiration from a computerized platform originally built by Microsoft for the New York Police Department (NYPD) to counter terrorism after 9/11. Domain Awareness System (DAS) mobilizes public and private closed circuit cameras to predict crime patterns and sound alerts. Today there are more than 90 fusion centers scattered around the country. The most celebrated instance of police-worn body cameras is from the Californian city of Rialto. There, randomized field experiments using just 54 mobile cameras in 2012 reported an 88% reduction in complaints filed against officers and a 60% fall in incidents of police use of force. Police wore specially designed HD audiovisual recording devices that captured all police encounters with the public. Rather than introducing a chilling effect, the use of body cameras – or cop cams – actually increased positive officer-citizen contact. Behavioral psychologists attribute these positive results to an increased sense of self-awareness and what is called “socially desirable responding”. People often act in ways that may be viewed as favorable by others when they themselves know they are being watched. The Rialto experiment has rocked the policing world. It was mentioned favorably by a New York judge who ruled in 2013 that the NYPD stop-and-frisk program was unconstitutional. She also ordered New York´s finest to begin testing wearable cameras. Meanwhile, hundreds of other American police departments are getting in on the act. In Tuscan Arizona, the police ran a 50-camera trial. Most of the officers originally opposed to cop cams quickly became ardent supporters. They are credited not just with catching officers doing something wrong, but also changing behavior before abuses occur. Likewise, in Greensboro, North Carolina, police scaled-up a pilot of body cameras to all serving officers. The scheme was launched with $130,000 worth of community donations, indicating impressive local buy-in from the get-go. Also, in Oakland, California, the police started using cameras in 2009 and now all of its officers are wearing them. And all this innovation is not reserved to the United States alone. For the past decade British police departments have also been testing body cameras. Following large-scale trials overseen by the country´s premier policing college, Met Commissioner Bernard Hogan-Howe noted how “people are more likely to plead guilty” when they know the incident in question was captured on video. In his view, these technologies speed up the justice process, put genuine offenders behind bars, and protect officers and would-be victims. There is also evidence of the so-called placebo effect whereby the mere presence of a camera defuses potentially violent situations. While comparatively inexpensive, there are still barriers to entry. Taser International, one of the companies marketing body cameras for law enforcement in Rialto, charges roughly $900 for each device and its accessories. Vievu Cameras, another supplier, charges a similar amount to capture data from daylong shifts. Server costs can be reduced by piggybacking off existing systems, but still run in the tens of thousands a year. Police forces do not appear deterred. Working with Taser, the London Metropolitan Police Service is running one of the largest field trials ever, and law enforcement agencies everywhere are taking note. Start-ups in Latin America and Africa are also getting into the act. The Igarapé Institute, a non-profit group based in Brazil, is developing an Android app that runs on open-source software. It is testing the app with Brazilian, Kenyan and South African police. And the biggest cost driver may not be the cameras or mobile phones, but rather data storage, training of officers, and the time required to manually review videos in response to public-records requests. Not surprisingly, there is heavy criticism of the use of mobile cameras by police forces. Critics believe they presage a dystopian future where “everyone is under suspicion” and Big Brother is watching. They have a point. If unchecked, there is a risk that crime prevention turns into pervasive surveillance. Body cameras running 24/7 are potentially invasive since police officers often enter people´s homes and interact with bystanders, suspects and victims. Many privacy activists take a dim view of the proliferation of cop cams. Yet there are also rights campaigners who see a possible win-win outcome of arming police with mobile cameras. The American Civil Liberties Union of Southern California – a regular critic of police abuse – has come out in favor of the technology. Along with the American Civil Liberties Union, or ACLU, they have argued that with the proper controls – including regularly deleting videos and keeping them private except for prosecutions – the gains in accountability outweigh privacy concerns. According to the ACLU “police on-body cameras are different (from surveillance) because of their potential to serve as a check against the abuse of power by police officers”. It is no longer a question of whether the tool is warranted, but rather how the solution is implemented. The controversy can be boiled down to a single question – how to balance the right to individual privacy against the responsibility of police to ensure public safety? In the case of cop cams, a series of checks and balances have been proposed to maximize privacy. The American Civil Liberties Union has advocated for the inclusion of citizen notification schemes and limiting filming in people´s homes. They advise against retaining data for longer than necessary and call for guidelines around the use of recordings, and some degree of public disclosure. The opportunities afforded by new technologies are gaining traction among police forces in Brazil, the United States, the United Kingdom, and around the world. Everyone agrees that crime prevention is no longer restricted to boys and girls in blue walking the beat, but also requires mastering new technologies. And while there is much to be gained by tapping into the digital revolution, there is also peril. The outfitting of police with body cameras is to some extent inevitable, but still raises tricky ethical and legal questions for law enforcement and citizens. So far the introduction of body cameras is being pursued cautiously. The long-term success of these tools depends in large part on public confidence in the integrity of the technology and the way it is applied. If crime victims do not call for help owing to a fear that their interactions will become public, then the experiment will fail. But if implemented effectively, then future Amarildos could be prevented. Whatever the future holds, this revolution is being televised.